MsNomadica: Crete: Taking a Break...and then a break from the break. Crete: Taking a Break...and then a break from the break. My sister, Martha, and I are recharging a bit on a Greek island. Our pace of travel up to now has been fast and furious. We only spent two days each in Dublin, Rome and Athens, one night in Cork to see Blarney Castle. But even the places we stayed longer in were so filled with activity that we barely had time to do anything besides our sightseeing activities. I spent a whole week in London, out and about most of my waking hours, and still didn't cover everything I wanted to see. We walked several miles a day, squeezing in as much as we could, because we don't know how long we will actually be here or when we will be able to come back. It's not a favorite type of travel, but we have been very happy with most of what we've chosen to spend time on. Still, it's been pretty exhausting. And though we have been fine with the hostels and AirBnB rooms we've booked, absolutely loved the place in Rome, we wanted a place completely to ourselves for a while. We did have that in Athens, a spacious one bedroom. But, for the same price, we could get a two bedroom apartment on Crete with a killer view of the Med. It was a no brainer for us. Not only did we want to spread out a little, and get some private space for a while, but we had stuff that needed to be done and couldn't be squeezed in between fast paced bouts of sightseeing. There was family business to take care of, I still needed to do my taxes and we needed to do research for the rest of the trip. Crete seemed like the perfect place to relax, recharge and get stuff done. It wasn't quite the paradise we were expecting, but still well worth the time, particularly at such a low cost. Working on our itinerary wasn't quite what we expected either. We don't want to commit to reservations of any kind further than a week or so in advance. That allows us to do things on the spur of the moment, like book this place or the 4 night cruise we're taking at the end of April. But we had spent almost 3 hours in the lobby of our Dublin hostel one morning, trying to make schedules fit for our next few stops, and that took way too much time away from more enjoyable activities. It's the kind of thing we planned to do in the evenings, after we are in for the night. But we are always so exhausted, we just want to eat, shower and climb into bed. So we still will not be making advance plans, and we've got a tentative schedule that we've already done some rough research for regarding transportation. But now is the perfect time to get details on plane, train and ferry schedules, as well as figure out what our lodging options are for the rest of our trip. Then, it should not take so long to make the final decisions when the time is right. We have only been in Crete for a few days now, and it has required a little adjusting on our part. The AirBnB listing stated that there were stores, restaurants and transportation nearby, and that is true. However, it neglected to mention that the apartment building was on a hill that is the equivalent of a 12 story building. And parts of the hill are so steep that it takes effort to remain standing upright when going downhill. The landlords are used to people renting cars for this area, but we like to use public transportation. Still, our AirBnB host is a sweetheart. A really nice young man, he picked us up at the bus stop in town when we arrived, and brought us to the apartment. Carried our bags upstairs, then drove us to the grocery store and waited to drive us back. Found us a corkscrew for the local wine Martha had bought, and got someone to come and fix the TV so we could catch BBC One for some news in English. Anything we needed, he was willing to help. We had forgotten to check if the property had a clothes dryer until after the reservation was booked. Well, I had forgotten, Martha didn't realize that they are not thick on the ground in these parts. The hostels have full laundry facilities, but we are lucky if the private residences will have a washer/dryer combo unit. No worries, though, there was a drying rack on the balcony behind my bedroom. Unfortunately, the wind blew it down after Martha had hung up half of her clothes, so we brought it inside. It sounds like gale force winds outside for much of the morning every day, but is usually very nice in the afternoons. Empty beach on Greek island was somehow not alluring. We walked down to the beach, though the water was definitely too cold for swimming. I had thought, when we made the reservation, that it would be nice to take a walk on the beach every morning and/or evening, the way I'd sometimes do with Peri in Destin. Foolish, foolish thought, since I didn't know about the 12 story hill. Also, while the Mediterranean is certainly more exciting than the Gulf of Mexico, at least to someone from Louisiana, I wasn't excited by this beach. It photographs beautifully, but unlike most of my photos, it's not as great in real life. Destin is beautiful, but I still complained about the sand. It was almost entirely empty of people, which is always nice. And the sand is soft, which is also nice. 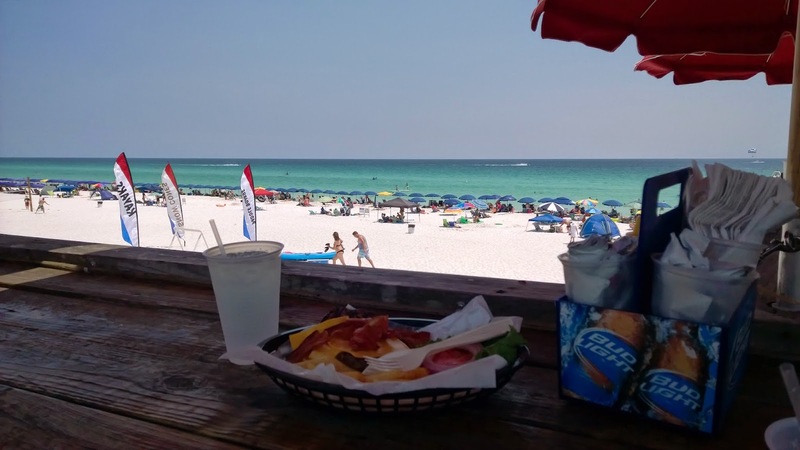 But even though an empty beach is fabulous, and so hard to find, I still prefer the white sand and emerald water of the crowded beaches in Destin. I know it's weird. This is Greece, for crying out loud. It's exotic, yet actually cheaper than Destin, even in summer. The 2 bedroom apartment we're in is only $100 a night during peak season. I don't know, maybe I'd feel different in Santorini, the place with all the white houses that is the poster child for Greek waterfront towns. But I remember not loving Rhodes, either, so maybe it's just that my preferences in beaches lie elsewhere. Or maybe it's just that I'm not wild about being at the beach. I love looking at the water, but I hate sand. We are headed to all kinds of Italian waterfronts after this, and then Malta, so we'll see how that goes. For now, my favorite islands are in the Caribbean. The thing is, though, we don't all love everywhere we go. Everyone has favorite places. On paper, Greece should be one of mine. I don't know why it isn't, but it's not. It has many, many great things about it - not the least, great people, fabulous food, low cost of living and lots of islands in the Mediterranean. What's not to like? I have no clue. It just doesn't call to me. Anyway. There were some very attractive rocks on the beach, way too big to call shells. I saw one with a definite bluish tinge that was almost as long as my footprint in the sand. Another had a greenish tinge that was pretty. The houses along the beach were varied, some pretty rickety and others quite nice. One thing we found strange was that they put the hot water heaters right on the roof next to the solar panels. Most sat horizontally, but some were upright. So many hot water heaters in view. This whole area is a tourist resort of sorts, a lot of places are closed because the season doesn't start until June. And while it's definitely nicer looking than Athens, there is still a derelict feel to many parts of the main street. There are many nicely finished buildings, most to rent out to tourists. But there are also quite a few deserted looking places. In any case, we sat and enjoyed the view for a while, and then walked up the beach to hit another grocery store. But after going into a couple of stores with big "Supermarket" signs, we found that they were really all just little convenience stores. And even the large store we'd visited on our first day had no fresh meat available, only frozen fish. Stumped, we asked at one of the stores where we could find chicken or pork, something not frozen. "Oh, you have to go into town for the big Supermarket. It's only 5 or 6 stops on the bus." All righty, then. The bus ride is actually nice, with views of the water most of the way. But the weird thing is that there is no ticket machine, and the driver does not issue tickets or take your money, either. Instead, a man or woman jumps on at some random stop and goes around selling the tickets. Still, the buses are excellent, very plush and modern, like long haul coaches. There are buttons above your head to push when nearing your stop, and space at the bottom if you happen to have luggage. Still, they only take you to the bottom of the hill. to the bare minimum, but oh. My. God. 12 stories. Carrying groceries. Major exercise, and the steepest part was the very end. The store was pretty similar to an American supermarket, the layout and bright lights. The store we went to the first day was very dark and mostly empty of people. One thing I thought was pretty cool is that the grocery baskets are all chained together. You have to put a coin in, 50 cents, 1 euro or 2 euro, to remove the chain. Then, when you return it and pop the chain back in, your coin pops back out. It's an excellent way to keep the baskets out the parking lot. So we've cooked, and done laundry and worked. Almost all of our time spent in the sitting area with a wall of windows showing the killer view. Not a bad place to spend time, particularly since it's costing us so little, what with eating our own cooking, and no entrance fees for tourist attractions. Martha went down into town today, while I finished up with the family business that had been accumulating. I still need to finish with my taxes, but tomorrow we will both go into town, since rain is forecast for the following day and we don't want to have to deal with that while climbing the steepest part of our little mountain. All in all, I still think it was a good decision to come here. But tomorrow, we will take a break from our break.